They led by 32 points in the second half, when Charlotte never reduced its double-digit deficit. "Lisa Leslie showed why she is the best basketball player in the world," said Charlotte guard Dawn Staley, a close friend of Leslie's. The two women avoided speaking to each other during Finals week. "I've seen it over the years where she's raised her level of play. It's comparable to Michael Jordan; each year he added something different to his game," said Staley, who's played with and against Leslie since they were in the 11th grade. "But with Lisa, she had everything. She's more consistent with it." The Sparks were good last year, too, compiling the league's best record at 28-4, but they were swept out of the playoffs in the first round by the Comets. "I saw that I wasn't as strong and I didn't play as aggressive when it came down to it and our team needed a basket," Leslie said. So she hired a personal trainer and worked four days a week for six months with Sparks coach Michael Cooper, the NBA's defensive player of the year in 1987. 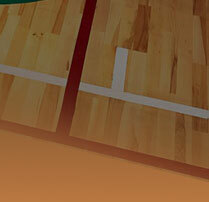 He challenged her ball-handling skills and shooting ability in one-on-one workouts. Once the season started, he designed the offense around the 6-foot-5 Leslie, telling the rest of the team to give her the ball. The most important thing Leslie added this season was mental toughness, a quality she admits she lacked even as she starred in college at Southern California and helped the United States win Olympic gold medals in 1996 and last year. "The one thing I learned about myself going back and watching tapes of all the losses that we've had is that I'm physically capable of doing this and dominating the game, but the mental part was not there," she said. "I don't know if it comes with age, but I had to learn to be mentally tough." Opponents used to taunt Leslie, telling her they would get into her head and by doing so would get her team to crumble. "I wanted to make sure I defied that. I wanted to be able to make sure that I was strong enough mentally, but also physically," she said. "To get to this point and win, mental toughness was the key for us and our focus. Now that we have that, they had better watch out." Charlotte coach Anne Donovan said Leslie set a new standard this season. "In the past, physical play may have distracted her or officiating might take her out of her game," Donovan said. "But this year she was very focused, never distracted, always confident and poised, always showed great leadership with the Sparks. Her game was at her peak." Leslie's trophy shelf grew crowded after being voted most valuable player of the All-Star game, the regular season and the Finals, where she was named on all 15 ballots. 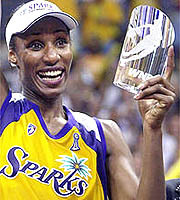 Leslie is the first WNBA player to sweep the MVP awards. Only Shaquille O'Neal, Michael Jordan and Willis Reed have done it in the NBA. "Lisa is at the peak of her career," teammate Tamecka Dixon said. "Lisa is our rock. She's our foundation." On Saturday, Leslie had her sixth double-double in seven playoff games. Her blocks broke the old record of three in a championship game, while the Sparks set marks for most blocks (10) and most assists (24). The Sparks' first WNBA championship meant even more to Christine Leslie-Espinoza, Leslie's mother and a former long-distance truck driver. She and her husband, Tom, were courtside regulars until he died of cancer in January. In addition to attending every game this season, Leslie-Espinoza watched game tapes three times. "But I never got on my mom about that because that was her healing," Leslie said. "The best thing for my mom has been having the Sparks to heal her. This championship replaces the sadness that she's had." The Sparks finished with a 34-5 record, including a 19-1 mark in their first season at Staples Center, where the two-time NBA champion Lakers also play. "We know now what it takes and we'll be back ready to defend our title," Dixon said. "Next year we're going to bring it even stronger."